Thanks to Carolina for the heads up. Be warned, there are a lot of "like". James Corden: You're used to being around famous people, you worked with many celebrities... but you had a major sort of fan-girl experience when you met someone from Harry Potter. Is this true, what happened? 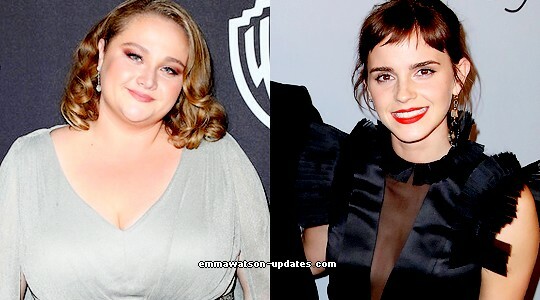 Danielle Macdonald: I was like at a Golden Globes party and I saw Emma Watson sitting on a couch and I kind of freaked out 'cause like I'm a huge Harry Potter nerd, like *huge*. It's embarassing so I kind of saw her and I was like "Oh my god, that's Emma Watson". And then she caught my eye and was like "You! Come here!" (seriously, her voice sounds so much like Emma's here XD). And I was like "What did I do wrong?" And I, like, looked around at my friend who was with me and was like "Is she talking to me?" And she was like "Come here!" I was freaking out! And so I went over to her and she's like "I loved you in Patti Cake$" and I was like "...uh-huh". Like, I couldn't talk! I had no words and it was I think the only time I've ever been speechless and then Natalie Portman was sitting next to her and she turns to me and she's like... and just starts like (? can't understand, sorry) and I was like "I can't move" and then Emma Watson was like "Can we take a photo?" and I was like "... uh-huh, yeah, I mean if you must, I guess" and she took a photo and I've never seen it. It was on her phone. Corden: You've never seen the photo?! Yeah, you're like "You don't need that photo!" Macdonald: Well, I can't exactly be like "Hey! Emma Watson, what up, girl? Like, can I have that photo you took?" Je crois qu'elle dit : "Natalie Portman was like, hand praising". This is her longest "quiet period" I remember. Im glad she is enjoying life a bit.